A Lady's Guide to Skirting Scandal by Kelly Bowen is up there among my all time favorite historical romances, so I'm always excited to get my hands on Kelly Bowen's books. 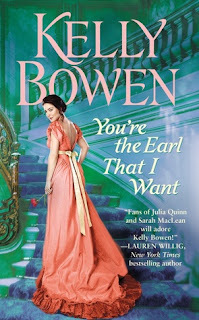 You're the Earl That I Want is a fun romp, but it didn't quite stack up to my high expectations of Bowen's books. Despite that, Joss and Heath work well together. They have the playfulness of childhood friends and the sexual tension of like-minded individuals. Joss' radical ways are just what Heath needs to see that he needs more than just a companion wife in his life. The suspense storyline was a little too convoluted for me (I'm really just not a fan of the historical mystery/romance combo though) and I had to skim it a little - and then got lost. I also have this weird pet hate in historical romances that have scenes from the perspectives of additional characters (ie. not the hero or heroine), often giving information about the mystery that the heroine and hero haven't worked out. So I did struggle a little with the suspense storyline. That said, I did enjoy to romance aside from this and will definitely be reading more of Kelly Bowen! Joss and Heath are a playful, fun couple, with heat sizzling between them that drives this romance. The suspense storyline wasn’t my favorite, but the romance makes this a worthwhile read from one of our Lords of Worth.